If you head into the great outdoors during National Camping Month, pack these essentials. Welcome to National Camping Month! The warm weather brings the perfect opportunity to get out of your routine and get outside. Sleeping under the stars, trekking through nature, enjoying marshmallows and screen-free time with your family and friends – there are a number of reasons to head out this month. 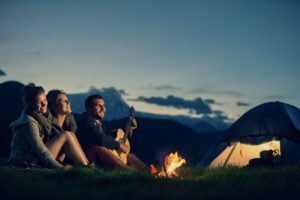 But before you do, make sure you’re ready with these camping essentials. A first aid kit. Nature brings with it new conditions. Be ready for a scraped knee, a bug bite, or whatever else comes your way with a fully-stocked first aid kit. A tarp. Even if the forecast doesn’t call for rain, the morning dew brings a layer of dampness you’ll want to defend against. A tarp under you tent can make the difference between a great night of sleep under the stars and a chilly evening spent shivering. Lantern(s). Camping is a very different ball game. You won’t be able to simply flip a switch for light – or will you? If you pack a battery-operated lantern, getting the light you need to perform evening tasks is a snap. Matches. Speaking of light, make sure you’ve got a way to start your fire. Bring plenty of matches so you can cook a warm dinner and enjoy heat and light. A map. We’re all pretty comfortable navigating with our phones, but what happens if you lose signal? Keep an updated map with you for backup. A pocket knife. You might not need a blade, but if you choose a pocket knife that has a corkscrew, scissors, etc. you’ll have a tiny tool that prepares you for a wide variety of situations. As you head into the great outdoors, do you have great protection to go with you? For all of your personal and commercial insurance needs, contact Pierce Insurance Group in McKinney, Texas today.